TAUNTON – Terry Dermody says he can’t take credit for coming up with the idea for his long-running, annual Coats for Kids charitable effort. “I stole it,” he said. 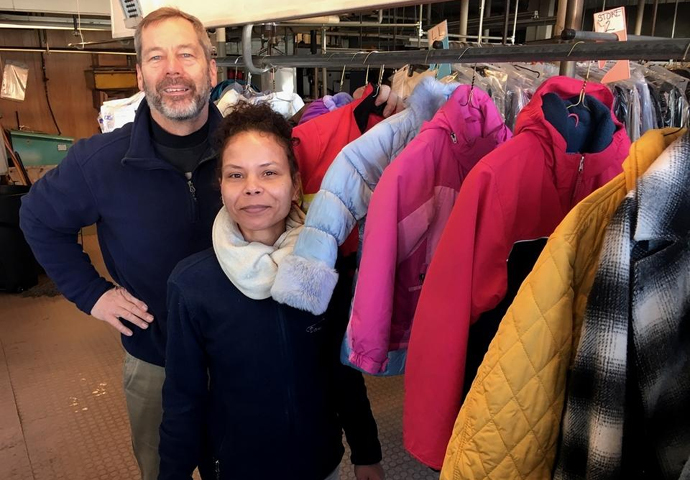 The owner of Taunton-based Dermody Cleaners said he read a story back in 1992 in a trade publication — in which the owner of a dry cleaning business in another part of the country described how he collected and cleaned used winter coats for underprivileged children. Dermody thought the altruistic endeavor would be perfect for greater Taunton. “It’s part of being in business in a community,” is how he puts it. And so he enlisted the aid and cooperation of the local St. Vincent de Paul Society office, which to this day distributes the donated coats at its Washington Street facility. Dermody and his workers are responsible for taking in and cleaning the “gently worn” winter coats. And considering the unusually cold weather that recently has gripped Taunton and much of the rest of the country, Dermody expects the coats will go like hotcakes. The response and support from the local community has always been strong, according to Dermody, who estimates he’s collected nearly 45,000 coats for needy children and their families during the past quarter century. Dermody expects by the time the “January-specific” clothing drive ends at the end of this month, he will have matched or surpassed the more than 1,400 coats taken in a year ago. He said around 500 coats so far this season have been donated. Dermody said his van driver, Jim Spring, this past week dropped off 200 coats at the St. Vincent de Paul Society building. He says only a small percentage of donated coats end up in the dumpster. Dermody says people, most of whom, not surprisingly, are customers, began dropping off coats in October. He says a good number of coats are donated each year after Christmas when some parents give their kids new clothes as gifts. Anyone who wants to donate to Coats for Kids can do so at any of his three locations — which includes 34 Cohannet St. and Harts Four Corners in Taunton and Sava’s Plaza in Lakeville. Dermody, who runs the business that his father and uncle started in 1955, said the L.L. Bean outlet store in Mansfield has been a big contributor. He said the coats that come from L.L. Bean usually are returns that can’t be sold due to small defects. Other contributors and volunteers include Crossed Sabers Ski & Sport in Raynham; eMation of Mansfield; Taunton High School’s National Honor Society; Taunton Extended Day Care; and Berkley Middle School. Dermody Cleaners offers customers free dry cleaning pickup and delivery, not just in Taunton, Raynham and Dighton, but also in Norton, Mansfield, Easton, North Attleborough and Foxboro. He said some of the coats that end up at St. Vincent de Paul are picked up at those customer locations. In terms of cleaning, Dermody said ski jackets are usually machine washed and that wool coats must be dry-cleaned. All coats, he says, are cleaned at the Cohannet Street store. Dermody, 60, has never liked to talk too much about the expense of his undertaking. He did, however, say that it normally would cost $12 to $13 to clean a child’s winter coat. And he says it goes without saying that it also entails a certain effort by himself and his staff. “Yes, it’s additional work. It doesn’t happen by magic,” he said.